Karmakanic: Who's The Boss In This Factory? 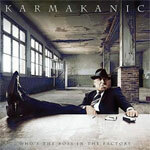 When the new Karmakanic album 'Who's The Boss In The Factory' came across my desk I tried to remember everything that I knew about this band. I knew they were somehow related to The Flower Kings. I knew that they are a prog band, and I knew that I had their 2005 release 'Entering The Spectra' boxed up with some other old CD's from the last time I moved. Other than that, I couldn't remember anything about them. After one spin through 'Who's The Boss In The Factory' the reason why was pretty obvious. Karmakanic's music is easily forgettable. The songs on this CD aren't horrible, and there is some impressive musicianship on display here. Other than that there unfortunately just isn't much about this album to get excited about. Maybe it is the overly drawn-out songs - opener 'Send A Message From The Heart' is one of three songs over 10 minutes long and clocks in just short of 20 minutes - or it could be something else entirely. I'm not sure. It's hard to put a finger on exactly what the problem is. I got bored with it way to quickly for a prog album. Basically 'Who's The Boss In The Factory' is lacking that certain intangible quality that makes a good album a great one. Karmakanic's music is easily forgettable. Basically 'Who's The Boss In The Factory' is lacking that certain intangible quality that makes a good album a great one.